"I robbed the thief. How can you fail to see the humor in that?" 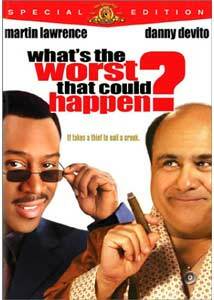 As numerous other reviewers have stated previously, the question asked by the title of Sam Weisman's What's The Worst That Could Happen? poses many answers. The most obvious one is that a film with so much unlimited potential can wind up being nothing more than a painfully unfunny comedy. That is not to say that the title is the only question asked by this film. In fact there may just be enough "whys" and "whats posed by What's The Worst That Could Happen to replace every single question on the SAT exam. As the film opens, Kevin Caffery (Lawrence) is falling in love with the beautiful Amber (Ejogo) after their first meeting at an art auction. She is there to watch a prized possession be auctioned off to the highest bidder in order to keep her place of living; he is there for less honest reasons. Kevin is a thief, but as in most films like this, he has a heart of gold. After saving the picture for her, Kevin is walking on clouds as the two begin a relationship. When Berger (Leguizamo) approaches Kevin with the plan to rob an unoccupied beach house owned by Max Fairbanks (DeVito), it looks to be the score of a lifetime and one that will allow him to give Amber everything she has ever wanted. As it happens, two people occupy the beach house, Max and "Miss September," with whom Max is having an affair, away from his wife Lutetia (Dunn). Kevin is caught going through Max's things, the cops are called and Kevin is taken into custody, but not before Max steals a beloved ring given to Kevin by Amber in plain view of the arresting officers. This understandably makes Kevin angry as he devotes his time after that night to getting his ring back; it is soon obvious that Max is a worthy adversary. It is no new development that novels translated into film are often done so poorly, but WTWTCH feels as though it may be the poster child for that statement. Based on a Donald Westlake novel of the same name, the only similarity the novel and the film share is the title. Among the numerous alterations made in the trip to the screen are character names, and even the entire climactic sequence. While the finale in the book reminded me of an Oceans' 11-style heist set in Las Vegas, in the filmed version the closing locations are at the scene of the original crime and lacks any sort of suspense or believability. In the original novel, each character was fleshed out and had their own personalities, yet in the film characters come and go with no real sense of purpose. Take for instance Tardio, the police detective played by William Fichtner, here is a flamboyant, wonderfully inventive creation that feels out of place with his purpose in the picture. It is clear that he and Kevin share a past but we never find out just what that may be, as the script by Matthew Chapman feels more comfortable giving Tardio's dogs horrible cases of flatulence rather than explain the previous connection. There is a bit of the same problem with the film's ending. As things build up to what is believed to be the demise of Max and a return to glory for Kevin, the film strangely does a one hundred and eighty-degree turn around that will leave many scratching their heads. While it would be giving too much away to go into detail, suffice to say the sugary finale feels out of place with the overly angry war of words the two lead characters have shared for the previous hour and a half. Aside from my love for the original source material, what made me anxious to view WTWTCH was, without a question, the cast; a case of expectations far outweighing results. While the weight of the movie rests on Lawrence and DeVito, it is in the supporting cast that the better performances can be found. Lawrence is good, but it is obvious that his work in both Bad Boys and Blue Streak worked largely because of his ability to play off of someone (Will Smith and Luke Wilson, respectively). Here, he seems alone and uninteresting. DeVito (who is always a pleasure) gives the feeling that he is channeling his character from Other People's Money, though his profanity-laced Congressional hearing is a bright spot. In smaller roles, Richard Schiff, Glenna Headly, Bernie Mac, Larry Miller, Nora Dunn, and William Fichtner each do nice work that, at times, outdoes the two headlining stars. What's The Worst That Could Happen? isn't a horrible movie by any means, just simply uninteresting and sloppily made. It is a shame, given the potential of the cast and the wonderful source material. It has been said that Donald Westlake has never cared for any of the filmed versions of his novels, and I would imagine this one has not changed this for him. Image Transfer Review: Like other recent release from MGM, this film is offered in a 1.33:1 pan & scan format as well as an anamorphic 1.85:1 widescreen transfer that preserves the original aspect ratio. The results are, for the most part, on the positive side, with only a few flaws that take away from the overall quality of the transfer. Colors are vibrant with the bright blues and reds inside of the club in which Amber works and Kevin socializes coming off strikingly well. Black levels are also done well with nice depth and little grain. The only problems that are noticeable are several print flaws with the most noticeable occurring at the start and end of the film. This is a nice transfer, if only slightly hampered by noticeable flaws that are unsettlingly rampant in a film that is less than six months old. Audio Transfer Review: Though advertised as a Dolby Digital 5.1 mix, What's The Worst That Could Happen? is like countless other comedies in the fact that it very well could have been Dolby Surround and there wouldn't be much difference. Dialogue sounds crisp and clear, while the left and right speakers do a nice job of blending in the hip-hop soundtrack. French and Spanish language tracks are also provided in Dolby Surround. Extras Review: Though the packaging boasts "special edition," this is a disc that is less deserving of that title than it may appear. First are two commentary tracks. One by director Sam Weisman and producer David Hoberman, while the other features numerous members of the cast including: Danny DeVito, Sascha Knopf, GQ, Glenne Headly, William Fichtner, Carmen Ejogo, Nora Dunn, and Sioban Fallon. The first track is undoubtedly the more interesting, as the two talk about adapting the film as well as each actor and what it was like to work with such a large cast. There is a bit of self-congratulating as well, such as when the two talk about their overall appreciation of the film and the numerous positive test screenings. The second track is a bit of a disappointment that falls into the category of "Too many actors makes for a crowded and dull commentary." It is obvious that each member was recorded separately, which is to be expected, but what is surprising is just how little each participant has to offer. There are long periods of silence between each actor coming in and introducing themselves, discussing their character and then leaving. Next are eight deleted scenes, as well as an alternate ending, all of which, thankfully, were not used in the final cut of the film. Running a little over nine minutes, these scenes are just not funny, while the alternate ending is worse than the one actually used. Credit Sam Weisman for leaving these out of the film. Scene Stealers is a mislabeled twenty-four-minute documentary on the making of the film, not a special on the supporting cast as I had hoped, given the title. This is a promotional piece with each interviewee talking about their admiration for others that worked on the film as well as their characters; promotional and just not very interesting. The Outtakes section, on the other hand, is funnier than the film itself, as these three minutes rival anything done in the running time of the feature film. The theatrical trailer for WTWTCH is presented in a 1.85:1 aspect ratio and is generally amusing and gets one excited to see the film—hey, it duped me. A music video for the song Music by Erick Sermon featuring Marvin Gaye (huh?) is also provided, though the song isn't all that great. As a film, What's The Worst That could Happen? fails; as a DVD, it does only slightly better. The video portion is on par with other MGM releases of late, while the extra features are plentiful for a picture that failed at the box office. As a rental this might work for some, but if you have no interest skip it and head out to the theater and see something better.